Não perca a oportunidade de estar no Lazy Loon! Tire vantagem de uma experiência norte-se na nossa atualizado, único nível, 3 cama / 1 casa de banho com uma espaçosa, piso plano aberto, e cozinha totalmente equipada para atender todas as suas necessidades de cozimento. Upper South Long Lake é de 800 acres de diversão, localizado a apenas 2 horas ao norte das cidades gêmeas e menos de 10 min SE de Brainerd. Desfrute de full-sol durante todo o dia e à noite com nossa exposição sul enfrentando, 100 pés de costa arenosa, uma pequena praia de areia para as crianças e, claro, da doca de pesca vai prometer ser divertido. Nível de elevação do imóvel, sem inclinação ou escadas para o lago, fazem deste um set up facilmente acessível para todas as idades e habilidades. Quando você estiver pronto para uma pausa a partir do sol, relaxar sob as grandes árvores de sombra e desfrutar de um jantar do baralho, enquanto abraça a deslumbrante vista para o lago, os mergulhões, ou até mesmo uma águia ocasional ou dois! Claro, não perca smores à noite e encontros ao redor da fogueira. Nós temo-lo coberto para legal, dias de chuva no interior, com uma variedade de tabuleiro e jogos de cartas, quebra-cabeças, e muito familiar DVD. Ou, apenas aconchegar-se com o seu livro favorito / revista no 3 temporada varanda isolada. Temos tomado muito orgulho nesta casa no pouco tempo nós possuímos-lo, e só espero que as famílias que considere a escolha de partilhar a nossa casa vai apreciar e respeitá-la também. Estamos à procura de adultos e / ou famílias responsáveis ​​apenas por favor. Absolutamente nenhuma festas e não é permitido fumar! Grand Casino Mille Lacs cerca de 30 minutos de distância. Paul Bunyan Land / Farm Este Old menos de 10 minutos! Angra do pirata em Baxter, aproximadamente 20 minutos de distância. Loved spending a weekend away at The Lazy Loon! So easy to communicate with if we had a question! Clean and inviting cabin right on the water! Cabin, location, lake all excellent!! The cabin was perfect for our family. We have a 9 year old in a wheelchair. The open spacious 1 level floor plan was exactly what we needed to have a great time away from home. The cabin is on the windward side of the lake, so the nice breeze we had all weekend kept the bugs away. Very well maintained and comfortable cabin. 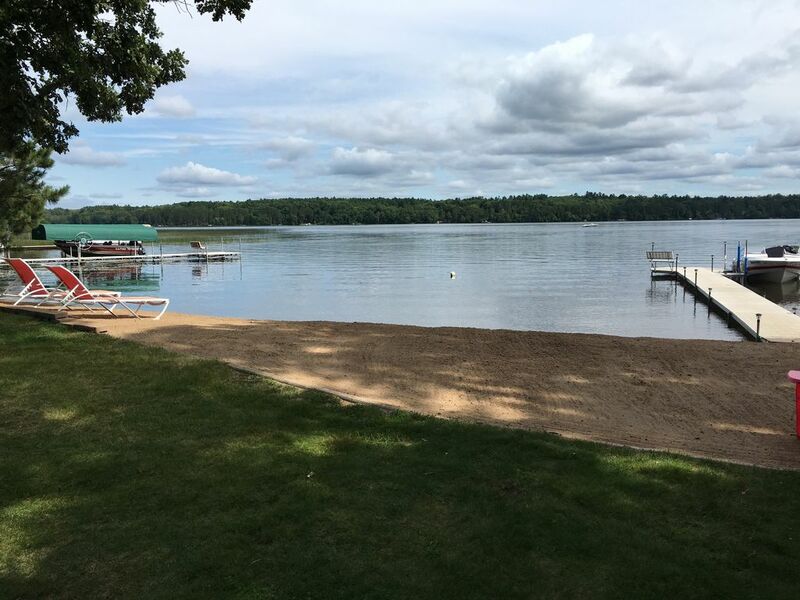 Plenty of things to do- canoeing, paddleboarding, swimming,camp fire in the nice fire pit, and a large deck looking out onto the lake so we could relax while the kids played in the water just feet away from us! We are all looking forward to going back! Our family had a fantastic time spending several days at this cabin that had everything....fully furnished, creatively decorated, lots of games and movies. We enjoyed the beautiful lake, sandy beach and awesome fires in the fire pit. Swimming, fishing and going out in the canoe provided lots of entertainment for our kids. The peaceful surroundings and quiet call of the loons were amazing. It was a perfect getaway for our family and we will be back. WE HAVE OUR RESERVATIONS IN FOR NEXT YEAR. IT'S QUITE AN AMAZING PLACE.. Grata place for older and younger folks. Cabin is spacious. We had a very nice stay at the Lazy Loon while visiting family. The view was beautiful and the surroundings were very peaceful. We even got to enjoy the big deck a bit in November. The bedroom with two twin beds was perfect for our kids and there was a nice assortment of books for them. Everyone was comfortable. The kitchen had everything we needed. Owners very responsive and we'd stay again! Nisswa: A pitoresca cidade com uma área adorável centro da cidade, localizado a cerca de 30-40 minutos de distância, fora Hwy 371. Eles têm várias boutiques, um sorvete e loja de doces (The Ox Chocolate), e alguns lugares para comer e beber. CANCELLATIONS: Full refund of deposit for any cancellations greater than 75 days from Day 1 of your scheduled reservation. $150 refund of deposit for any cancellations 60-74 days prior to Day 1 of your scheduled reservation. Full forfeit of $400 deposit for any cancellations less than 60 days from Day 1 of your reservation.